A princess must find her place in a reborn world. She flees on her wedding day. She steals ancient documents from the Chancellor's secret collection. She is pursued by bounty hunters sent by her own father. She is Princess Lia, seventeen, First Daughter of the House of Morrighan. The Kingdom of Morrighan is steeped in tradition and the stories of a bygone world, but some traditions Lia can't abide. Like having to marry someone she's never met to secure a political alliance. Fed up and ready for a new life, Lia flees to a distant village on the morning of her wedding. She settles in among the common folk, intrigued when two mysterious and handsome strangers arrive—and unaware that one is the jilted prince and the other an assassin sent to kill her. Deceptions swirl and Lia finds herself on the brink of unlocking perilous secrets—secrets that may unravel her world—even as she feels herself falling in love. It can take years to mold a dream. It takes only a fraction of a second for it to be shattered. My horse was huge, almost as big as his beast. He gave me a hand up, but held back the reins. "You'll regret it if you break your word to me." I glared down at him. "A cunning liar who relies on the word of another? I suppose I should appreciate the colossal irony." I still had six hours of daylight. I filled my bota at the pump and grabbed a sack of oats for my horse. They had a long lead. It would take a while to catch up with them. But I would. I'd do whatever it took to bring her back. I found her once. I would find her again. 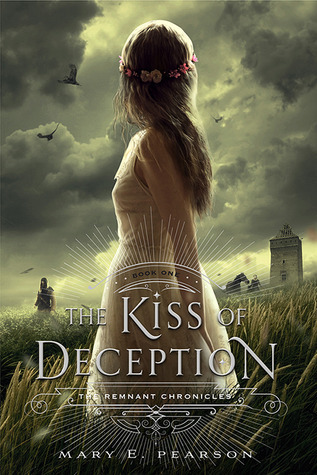 In the effort of full disclosure, there was a time when The Kiss of Deception was on my TBR list and I removed it. I don't know why exactly. It was on my list and I decided I didn't want to read it anymore. Nor do I remember why I put it back on, and the subsequently asked for it as a birthday gift. It might have been a review of The Heart of Betrayal, but who knows. I do know is that Past Andrea was a fool. Lia is the first daughter of her family, a role that within her world imbeds her with certain gifts, and has been promised in marriage to a neighboring kingdom's prince. Having never met said prince and annoyed by the fact that her brothers can marry for love, Lia and her best friend/maid Pauline run off for Pauline's native home, Terravin. After obtaining a room and jobs with Pauline's old family friend, Berdi, Lia comes into her own. Lia isn't a snobby princess or one demanding to be waited on, but a young woman determined to earn her keep and willing to get her hands dirty. All she wants is freedom and the opportunity to make her own choices and that's what she has found in Terravin. Enter the Assassin, sent to kill Lia, and the Prince, intrigued by the woman who opted to runaway rather than marry him. After tracking Lia down, and being impressed by her skill at hiding her tracks, both men happen upon one another at the same time. Neither knows who the other is or why they're there, but they believe each others false stories as easily as Lia - though as things progress they do grow more and more suspicious of one another. I'm not going to touch too much more on Rafe and Kaden because I don't want to drop any hints as to which guy is which. I will say that Mary does an excellent job of keeping us guessing as to who these men truly are. If you're worried about there being a love triangle (like I did), don't be! At some points you feel like it's heading that way, but it's not. Lia's feelings for the one guy are more along the lines of "Yeah, he's attractive, but . . ."
The first half of the book is a bit slow and took me a bit to read, but once the Assassin reveals himself Oh. My. God. I couldn't stop reading! I must have read the second half in a matter of hours - and the last few chapters under my covers because it was super late and even my book light was keeping my husband awake. And the ending! I can't tell you how many times I reread that last chapter and how many times I've read it since. It's so perfect. Even with the cliff hanger (but since The Heart of Betrayal it's okay because you can immediately pick it up and continue), I wasn't mad. Normally cliff hangers drive me to the brink of instantly, but something about this one is so beautiful and so wonderful that I didn't care. This is definitely a book you do not to miss out on; as soon as I finished I ordered The Heart of Betrayal and preordered The Beauty of Darkness.